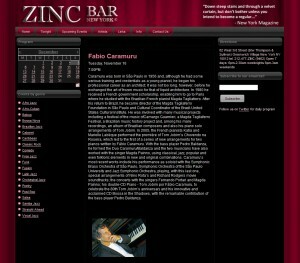 The Zinc presents for one show only, Tuesday November 16, from 7 to 9pm, extraordinary Brazilian pianist, composer, arranger FABIO CARAMURU, a São Paulo native, who has garnered great critical momentum with the release of his “JOBIM BY CARAMURU” a definitive robust 2 cd recording of the master’s compositions, with Caramuru’s take on it. Caramuru’s work range from playing with his duo with bassist Pedro Baldanza, with a very innovative album “BOSSA IN THE SHADOWS”, with the Duo. One could not leave his “MOODS, REFLECTIONS, MOODS” incredible solo album, with compositions from Jobim to Camargo Guarnieri and Richard Rogers to popular Brazilian folk songs. 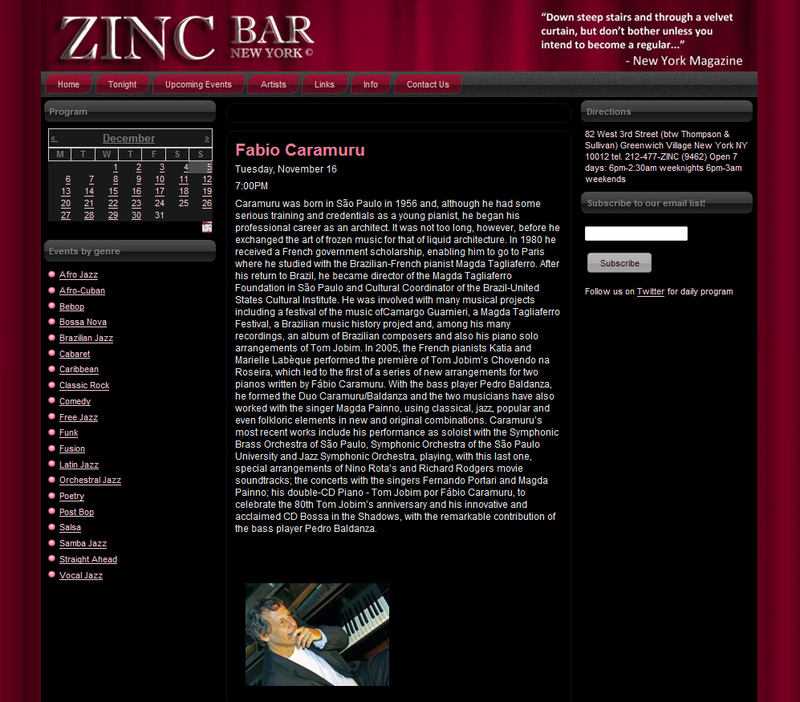 On this solo concert, New Yorkers who are discovering Caramuru, will be delighted with his handling of jazz, classical, popular and folkloric compositions, that made his diversified career a success in relative short time. Caramuru was born in São Paulo in 1956 and, although he had some serious training and credentials as a young pianist, he began his professional career as an architect. It was not too long, however, before he exchanged the art of frozen music for that of liquid architecture. In 1980 he received a French government scholarship, enabling him to go to Paris where he studied with the Brazilian-French pianist Magda Tagliaferro. After his return to Brazil, he became director of the Magda Tagliaferro Foundation in São Paulo and Cultural Coordinator of the Brazil-United States Cultural Institute. He was involved with many musical projects including a festival of the music of Camargo Guarnieri, a Magda Tagliaferro Festival, a Brazilian music history project and, among his many recordings, an album of Brazilian composers and also his piano solo arrangements of Tom Jobim. In 2005, the French pianists Katia and Marielle Labèque performed the première of Tom Jobim’s Chovendo na Roseira, which led to the first of a series of new arrangements for two pianos written by Fábio Caramuru. With the bass player Pedro Baldanza, he formed the Duo Caramuru/Baldanza and the two musicians have also worked with the singer Magda Painno, using classical, jazz, popular and even folkloric elements in new and original combinations. Caramuru’s most recent works include his performance as soloist with the Symphonic Brass Orchestra of São Paulo, Symphonic Orchestra of the São Paulo University and Jazz Symphonic Orchestra, playing, with this last one, special arrangements of Nino Rota’s and Richard Rodgers movie soundtracks; the concerts with the singers Fernando Portari and Magda Painno; his double-CD Piano – Tom Jobim por Fábio Caramuru, to celebrate the 80th Tom Jobim’s anniversary and his innovative and acclaimed CD Bossa in the Shadows, with the remarkable contribution of the bass player Pedro Baldanza.